With so many epic landscapes to explore in Chile - from the wild and glacial Patagonia to the arid Atacama desert, and the lush Central Valley vineyards in between, we never even considered that Valparaiso might end up being one of our favorite stops. It's just a short one hour drive from Santiago to Valparaiso, yet the atmosphere of this port city is laid back. Compared to Santiago, Valparaiso is a coastal city, and the culture here is influenced by the sea. Perhaps because of that, everything seems more vibrant here - the colorful neighborhood barrios, the food, the people. You too may be surprised how much you like it. Spend a few days here, and rent a car - with a car, you'll have even more options to explore the coast north and south of Valparaiso. 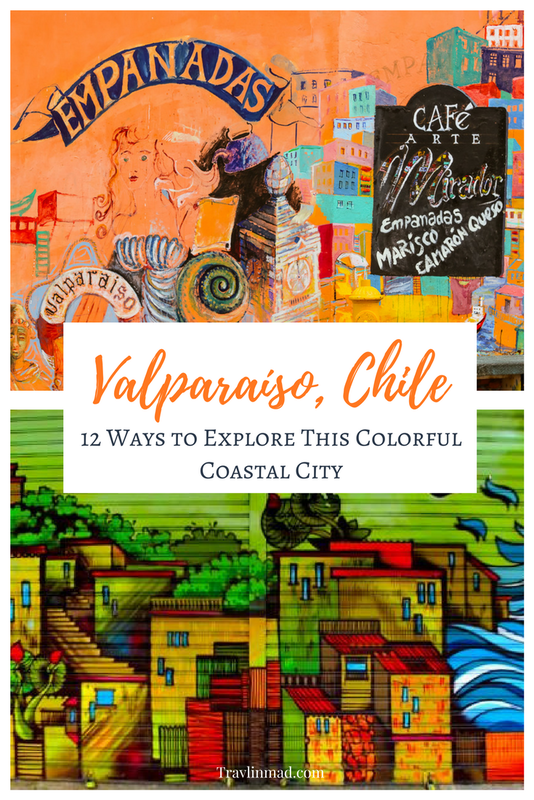 But if you're only in the city, here are our recommendations for 12 things to do in Valparaiso, whether you have one day or a whole week to explore. This post contains affiliate links: if you purchase through our links, we may earn a small commission at no extra cost to you. You'll be doing a lot of walking here, but consider taking one these organized walking tours by Free Tour Valparaiso. You'll get an in-depth tour by a local guide - people who are so passionate about their city, they do the tours for free! That's right, they're FREE, and the hidden gems they pass on are priceless. If you love it, please tip generously! Another free walking tour that comes highly recommended is Tours4Tips. You're under no obligation to pay for the tour and offer whatever tip you think it's worth at the end! A block from Avenida Argentina by the end of Calle Simpson, you can take the modern Polanco Lift - an 8-passenger elevator versus the traditional funicular - to explore the narrow streets of Polanco. Street art is a hallmark of Valparaiso, but whatever you do, don't miss it in Polanco! Beaches in Chile are beautiful, but rocky. For a local beach in Valparaiso, head to small but comfortable Playa Torpederas in the Playa Ancha. If you're hungry for some serious beach time though, take the bus from Valparaiso’s Avenida Errazuriz or drive north to Vina del Mar. The bus will run around 500 pesos (one way) and will bring you to the beginning of Vina’s esplanade where you can walk to shopping and good beaches from there. This folded meat pie (primarily beef in Chile) is a traditional food in Chile and considered its national dish. We had them both fried and baked, but either way, we never met an empanada here we didn't enjoy! One of the cultural icons of Valparaiso are the colorful barrios - neighborhoods defined by the hilly terrain and surrounded by culture, colorful street art, bars and restaurants. You can reach these two hills through the El Peral funicular, located off Plaza Sotomayor. The neighborhoods are vibrant and multicultural, and a good place to discover the true flavor of Valparaiso. Set up high on Cerro Artillería on Paseo 21 de Mayo, the museum displays Chile's glorious seafaring past and offers a fantastic view of the city from its front lawn. Bellavista's most famous resident artist was Chile's poet Pablo Neruda, and you can visit his home and now museum off Avenida Alemania. Visitation is first-come, first-served, so try and get there early since they don't accept reservations. There's a good audio guide system included in the admission and you can wander around at will, lingering over Neruda's interesting collections and artwork. Ascensor Artilleria is one of the 16 funicular railways that run in the city, and one of the most scenic. It's located near the Naval and Maritime Museum, with lots of shopping vendors, street artists and cafes, making it a perfect place to spend the afternoon. Chile has a diverse list of must-eat foods, which isn't really surprising given the vast size and number of climate zones of the country. Obviously, when you're at the coast in Valparaiso, you'll want to eat seafood. But don't pass up the chance to have some of the everyday "local" dishes the country is known for, like Pastel de Choclo (Corn Cassarole) and Chorillana. Braised beef and onions piled high on a mound of french fries, topped with cheese and sometimes a perfectly cooked fried egg reminded me of the Peruvian Lomo Saltado, only better. We had it throughout Chile but loved it in Valparaiso. And of course, you have to wash down any meal with a glass of Chilean wine (the Casablanca Valley wineries are so close if you want to take a tour)! Valparaiso has the kind of outdoor markets you can spend hours exploring, especially on weekends. There are Saturday fruit and vegetable markets and Sunday flea markets. But you can find mini markets throughout the city any day of the week, selling everything from fresh produce to ice pops. Grab something to eat as you explore! It's widely known that life in Latin America is social, which alone leads to a more stress-free life. Chileans in Valparaiso enjoy a very European cafe culture and we noticed friends and colleagues socializing on the street throughout the day, lingering to savor a good cup of coffee over conversation (not gulping it down on the go). Americans might find this hard to do - I did. I wanted to cram in as much as I could while I was there. But we forced ourselves to linger a bit longer over coffee at the Cafe Republica, to slow down and take it all in. For a truly unique, local experience (and nominal fee - around $2-$3 USD), hire a local fisherman to take you around Valparaiso Bay for a short ride in their boat. Catch one at Muelle Prat, on the waterfront across from Plaza Sotomayor. The boats and their owners are as colorful as the city itself and it's a great way to see the city, and a slice of real life. You may even see some sea lions out there on the water! Have you visited Chile or Valparaiso? What's your favorite "colorful city"?